RafRamp﻿s has been fabricating and manufacturing dock levelers for more than 8 years to meet the growing demands for effective, safe and economical loading solution for the docks. The simple business philosophy for manufacturing a quality product with user safety in mind continues to be our approach in the marketplace. RafRamp dock levelers continuing success in designing, engineering, and manufacturing loading dock solutions has gained RafRamps dock levelers an excellent reputation within the materials handling industry. There is huge lack of locally manufactured dock levelers in the region which RafRamps have effectively met local demands. Many clients who have bought Raframps dock levelers have saved thousands of hours on loading and benefited from local support. a, CE Certified - Due to lack of standard Certified body in Gulf we have adopted CE certification standards and are first and only manufacturer of CE certified dock levelers in Middle East. 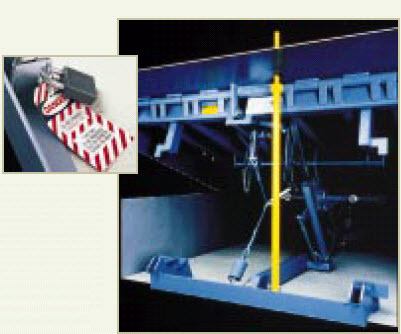 All our dock levelers are tested according to stringent standards. We are only material handling company in the world where every dock leveler is physically load tested with live load before delivery. b, GCC Specifications - Most of the manufacturers that provide dock levelers in Gulf Region are based outside the Gulf where there is less harsh conditions compared to the heat and dust in Gulf. We provide dock leveler that has the design and the materials made from durable heat and dust resistant materials. We provide steel tank that does not deform over time due to heat and does not contaminate the stored oil. The inverted cylinder design seen below cleans the dust and maintains long life of the cylinder. The hydraulic pipes provided are heat resistant and long lasting. There is optional hot dip galvanizing option for longlasting antirust properties. c, Durable Hydraulic System- Hydraulic system is the most important component in the dock leveler. The positioning of both platform and hinge lip ensures high reliability and low maintenance. 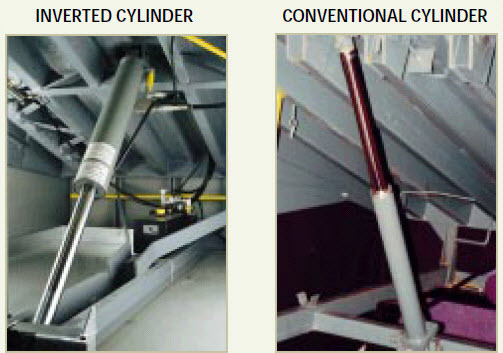 We have found many conventional hydraulic cylinders are mounted such that when the dock leveler is in closed position the cylinders are exposed to different elements which can reduce longevity of the cylinders in long run. We have made the inverted cylinder which ensures that the dust and dirt settles down and heat and dust are kept away when the dock leveler is closed. Our HYPO motor is durably made to work in conditions up to 65 C which would fit the Middle East climate. d, Strong Steel construction- The frame is durable and solidly made with beams providing the main support for the structure. We make with strong and durable grade of ASTM A 36 standard steel. A construction system with strong hinges is made to prevent the moving parts of the leveller from maladjustment due to grime. e, Easy Maintenance - The dock leveler is made for easy maintenance and there is optional support bar to support the platform and lip during service and maintenance these struts are used by maintenance personnel so it does not accidentally close. f, Delivery & Support - We have production line that fabricates dock levelers in efficient and fast manner thus comparitively we have lower delivery times. As we have offices and warehouse in Gulf, our support personnel will respond within 24 hours thus preventing longer downtimes. Click below to get a custom quote according to your needs for dock leveler.